WEBSITE LINKS are a great way to re-direct your visitors to other useful websites. The website links could be to display your associated organisations, interesting sites or further information on topics that relate to your organisation. To set up this function, select WEBSITE LINKS on the left side menu to reveal a dropdown that contains Options, Link Types and Links. Begin by selecting OPTIONS in the left side menu. Click EDIT and change MENU DISPLAY to YES and creating a TITLE for the page, e.g. 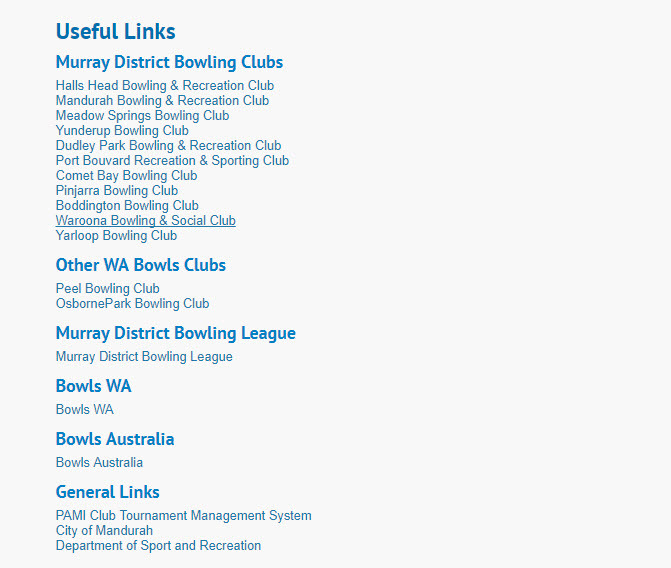 ‘links’ or ‘useful websites’. If you would like to categorise your links, select LINK TYPES. Click ADD, provide a TITLE for each category and set PUBLIC DISPLAY to YES. Click on LINK TYPES in the left hand menu again and set each STATUS to a GREEN TICK. Now click on LINKS in the left hand menu to add your individual links. Select the LINK TYPE if you created these, otherwise leave it as it is. Enter a TITLE and the links URL. You can set the order that the links appear in by entering numbers under ORDER. Lastly, click on SPONSORS again in the left side menu and set the STATUS of each sponsor to a GREEN TICK.